Crime Writers of Canada Arthur Ellis Award winner for best first novel! A Tour De Force - part Victorian Thriller, part Romantic Adventure, part Picaresque Comedy. See Reginald hide a ransom note under Sir John A. Macdonald's right boot. Meet Belvedere La Griffin - escaped lunatic, diminutive dandy of note - immaculate from his gleaming gold monocle to his dazzling Chantilly riding boots - armed to the teeth, and desperate for adventure. He leads Reginald on his quest for Revenge. Marvel at "La Divine" Sarah Bernhardt - the most celebrated actress of all time, seductress of five crowned heads of Europe and the Pope of Rome. She is Reginald's guiding light. Learn from Doctor Marmaduke Dandy - the eccentric Chief Alienist at the Ontario Provincial Lunatic Asylum. A man with a mission - to treat the legions of insane Upper Canadians crazed by lustfulness. Witness Reginald's trip to The Cloister where one expects to be greeted by a fully formed woman wearing nothing save a lewd grin and an arrangement of vegetables so highly suggestive as to leave none save a dullard in doubt as to their symbolism. Be there as he encounters the charming denizens of the brothel: Big Sue - the giantess bouncer, famous for her jar of pickled human ears, and Pansy - a living dream. Rub shoulders with members of the dreaded Dead Dog Gang: Dan "The Dude" Dougherty - the Beau Brummel of the Toronto underworld, and inventor of the copper eye gouger. Little Dave Goody - a malignant little rodent of a man, The Dude's chief assassin and lout extraordinare. Piggie O'neil - every filthy fiber of his being crying out of the porcine. 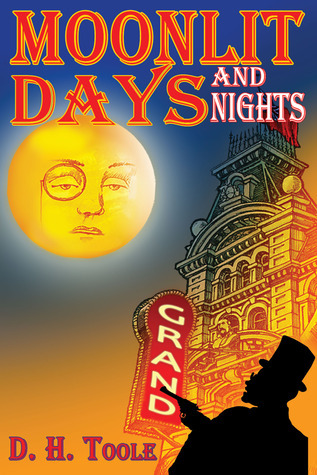 Moonlit Days and Nights takes readers on an uproarious, charming frolic through 1890’s Toronto. The story is told through the first person narrative of Reginald Ravencroft, a naively innocent young man raised by two loving uncles in the country. Reginald comes of age, cashes in his inheritance, and is set on travelling to Toronto and living the high life in order to attract a bride. When he arrives, he learns that Toronto turns out to be much more than he expects and soon finds himself embroiled in one hilarious caper after another. To say this book is brilliantly written, would be an understatement. The prose is witty and quippy, the characters terrifically credible, and the escapades wonderfully outrageous. I found myself laughing aloud and shaking my head while reading furiously to the next scandalous and wicked frolic. Descriptions of locations, people, and monuments are as vivid as the storytelling, truly bringing to life Toronto as it was during the Victorian era. Highly entertaining, this is a unique novel, unforgettable, and truly a joy. What a wonderful way to escape! Very highly recommended. Get this book. Get it now.